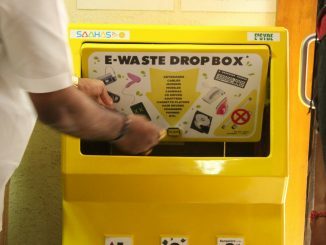 As per the E-waste [Management] Rules, 2016, meeting is treated as an opportunity of hearing to the processers and for those who have not attending the meeting and not complied, further action will be initiated and also their names will be published in the website of the Board for information of all . Since the provision of individual collection center is no more existing in 2016 rules, the collection center for which the authorization has given by the Board is deemed to have been withdrawn and they are require to surrender the passbook/authorization. All the units are required to give quantity of material received by them from 1.4.2016 along with its source and discontinuity from the generator side. The producers are required to obtain EPR approved plan from CPCB. The manufactures including the parts of electric and electronic equipment are required to get it registered. All the bulk consumers are required to give their waste to the authorized dismantlers/recyclers after making entry in the passbook issued by the Board. The plastic waste (10 to 12% of the total waste) generated during processing of e-waste shall be handed over to registered recyclers under the Plastic Waste Management Rules, 2016. The other waste has classified under the hazardous and other waste shall be required to hand over the waste to the actual user. All the non-recyclers waste shall be disposed to TSDF facility. The Board has proposed to design vehicle for transportation of e-waste as done in case of transportation of hazardous waste. The dismantlers and recyclers shall provide infrastructure as specified in the guidelines. The recyclers involved in generation of effluents are required to operate with preliminary treatment plant as per the directions of Hon’ble Supreme Court. Any violation noticed closure directions will be issued. The area specification of 300 sq.mt/ton of dismantling activity and 500 sq.mt/ton for recyclers will be followed. Non-availability of space, existing units are required to be shifted within 6 months. The Board will not allow dismantler/recyclers activities in residential area. Annual report shall be submitted within 7 days time. The Board hereby directs all the bulk consumers, manufacturers, recyclers, dismantlers to follow/comply e-waste (Management) Rules, 2016 and treat this as final opportunity given to them. E-waste can contaminate ground water and pollute air. KSPCB is trying to educate all industry bodies regarding this and make e-waste handling a smooth and principled affair. The quantity of e-waste produced in the city is unknown, and facilities for scientific processing non-existent. How then, does the e-waste get processed?